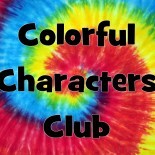 FYI-Starting Feb 21, 2014, Colorful Characters Club will be taking a hiatus from blogging while the cast members prepare for and go on their spring breaks. We’ll post again some time in the near future. We’ll still continue to post videos on Youtube, so, watch for those! 🙂 Thanks for reading! This entry was posted on February 19, 2014 by colorfulcharactersclub.